I can’t begin to tell you the number of calls I get from prospective clients telling me how hurt they are as a result of a car accident, slip and fall, or other traumatic accident; only to find out that their accident happened like a DECADE AGO! I ask them whether or not they started a claim. They tell me no. I ask them whether or not they had a personal injury lawyer before calling Goldfinger Injury Lawyers. Some tell me that they tried finding a lawyer but nobody would take their case, or that all of the lawyers they spoke to wanted a big upfront monetary retainer. Others tell me that they never thought of looking for a lawyer. When questioned why they didn’t think of finding a lawyer sooner, they tell me that didn’t think that the passage of a long period of time (like over 2 years) was a big deal; and that any lawyer could help them out of this mess. My law firm is great. No. Check that. My law firm is AMAZING! We do some fantastic things for our clients which sometimes even shock myself. Shameless self promotion? Check. But one thing my law firm can’t do is re-write the law. In fact, I don’t know any lawyer living in a democratic society who can re-write the law to make it suit their client, and their client alone. Maybe that happens in the Democratic Republic of Congo, but it sure doesn’t happen here in Ontario. Our provincial government has set some hard and fast rules for limitation periods. Those limitation periods can be found in the Limitations Act, 2002 S. O. c. 24. Limitation periods are time periods for which you have to start your claim against the at fault party. If you start your action outside of a limitation period, your case will likely get dismissed by a Judge and thrown out of Court. Even worse, you may be ordered to pay the other side’s legal costs for having to defend a claim which was started beyond the limitation period. Can you say double whammy? Think of a limitation period as a ticking timebomb. The timebomb starts ticking from the date of loss, or from the date of the accident. Most accident/injury cases in Ontario have a two year limitation period. So, at the two year mark, if you have yet to start your claim against the at fault party; then that timebomb explodes because you’ve run out of time to bring your action. The fact that you did not consult a lawyer during that two year time period, or you tell the Judge that you didn’t know the state of the law is no excuse. Remember: ignorance of the law ain’t no excuse. If it were, thieves would steal; murderers would murder, fraudsters would defraud and they’d all try to get off by pleading ignorance of the law. That’s not how the judical system in Ontario works. Go to any Courtroom in Toronto, Brampton, London, Oshawa, Peterborough, you name the town, you might see a whole slew of people begging Judges to let them off charges because they didn’t know the state of the law. In each and every case (with very few exceptions), those Judges tell those people that ignorance of the law is no excuse. As a citizen living in Ontario, it’s your responsibilty to know what’s legally right, and what’s legally wrong. That includes knowing how long you have to start your personal injury claim, or any other claim for that matter. So, it pains me when a person calls me who sustained a brain injury in a car accident back in 2003 and never thought of starting a claim. Now, they want my lawyers to start an action against the at-fault driver. Like I said before, I can’t re-write the law. There are some exceptions to these limitation periods. For minors under the age of 18, the limitation period does not begin to kick in until that minor reaches their 18th birthday. So if a child that’s 7 years old sustains a brain injury in a car accident because a drunk driver ran a red light, that minor does not have to start the claim until 2 years after their 18th birthday. They may elect to start a claim while they are minors, which is not a bad idea to get the ball rolling on the case. But, a minor in Ontario will need to be represented by a Litigation Guardian. A Litigation Guardian is a person of the age of majority (over 18) who will administer the litigaiton on behalf of the minor and protect their interests. More often than not, the Litigation Guardian will be mother or father of the accident victim. So, if you’ve sustained a serious personal injury accident, please don’t get hurt twice. Consult a lawyer sooner rather than later in order to protect your rights and protect that limitation period. If you don’t, you may find yourself without any recourse against the at fault party. Is anyone else following the mayoral fiascos in Toronto and London? London’s Mayor Fontana allegedly used public funds to pay for his son’s wedding at the Marconi Club (that’s a big Italian Banquet Hall here in London for all you who live outside of Middlesex County). 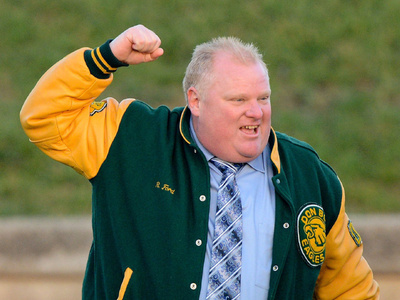 And in Toronto, Mayor Ford is found to have acted in a conflict of interest for raising funds and refusing to pay back funds for his football foundation. The ridiculous thing is that it would have all gone away had Ford swallowed his pride and paid back the $3,150 which he raised. I know that the money would have needed to come out of his own pocket and that would have sucked and been unfair. BUT SERIOUSLY: I’d rather pay $3,150 and keep my job as mayor of Toronto rather than jeopardize my standing and my position. Talk about insane stubborness! The public servant fiascos in London and Toronto have been better than any reality television series. Municipal and constitutional lawyers are loving this. So am I. Bring on the by-election!